This is actually a repost from March but felt it fitting as we approach Easter. I finished reading the book of Mark today. In Mark Chapter 16. We see Mary Magdalene, Salome, and Mary the mother of James going back to the tomb to put some spices on Jesus’ body. In verse 3, it says that “on the way there they were discussing who would roll the stone away from the entrance to the tomb. Yet we know when they arrived at the tomb, they found the stone had ALREADY been ROLLED away. Like you, I’ve heard or seen this passage of scripture many times and it’s often quoted/illustrated around Easter time. However, today the Holy Ghost allowed me to see the text with fresh eyes and new application. I’m saved, so I’ve already believed and confessed that Jesus died and rose again. Yet, is there not some other things that are DEAD in our lives? Are not there some things that have been BURIED and TUCKED AWAY in the recesses of our HEART and MIND? Some for many years. Some things have been so deeply buried that we don’t even think about them often. Our emotions, heart, mind have become deaden and we’ve longed since forgotten about there existence, if it were possible. When we see these women in the beginning of chapter 16, they’re preparing to go say their FINAL goodbyes to Jesus. They were going to put some sweet smelling stuff on a DEAD body -a DEAD Jesus. Jesus represents HOPE, LIFE, LIGHT, HELP, SUPPORT as these are all the things He promised He was. Yet, now they find all that DEAD but they were preparing to send it off smelling good. Not unlike what we do at times when something we’ve hoped for, supported, or that brought light into our life fades away. We’ll dress it up we sweet smelling phrases like , “must not have been for me anyway”, “I’m just fine”. However, they weren’t in denial that Jesus was dead. And we don’t need to be either. Reality is that some things DIED in us, around us, and even through us. Just as the women went back to the tomb, we need the courage to revisit some tombs in our lives. Their expectation when revisiting the tomb was to put some things to rest. Probably expected to leave in MOURNING and ANGUISH. Unexpectedly, the stone had already been move d away, while they were attempting to ponder how they were going to get the thing done. Some of us are pondering within our selves, “how am I going to get past this” but if we’ll muster up the courage to not only revisit the tomb but ENTER in the places that’s been BURIED/TUCKED AWAY. We will find that the experience WILL NOT be the same. RESURRECTION POWER had visited the tomb! 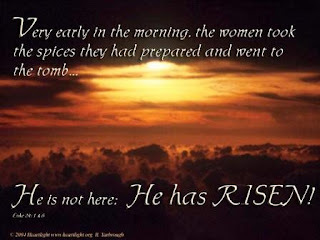 Just like Mary and the other ladies, instead of leaving the tomb in SORROW, we’ll leave in AMAZEMENT and JOY. The Holy Spirit is unctioning us to REVISIT the TOMBS of dead DREAMS, RELATIONSHIP, HOPE, JOY, LOVE, PASSION, PROMISES or whatever may be dead in your life, and TRY AGAIN. The RESURRECTOR has already gone before you to MOVE the STONE away and He promises that it absolutely will not be the same. EXPECT some thing different because DIVINE RESURRECTION has already ARRIVED but you must go to the place you left it. Thank you for stopping by and leaving a comment. I appreciated it. I enjoyed looking over you site. I will be back. I trust you had a great Resurrection Sunday! Wanda thank you so much for sharing and thank you for your encouraging words to me. Mean a lot! Blessings.